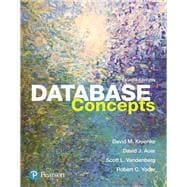 by Kroenke, David M.; Auer, David J.; Vandenberg, Scott L.; Yoder, Robert C.
Here’s practical help for understanding, creating, and managing small databases—from two of the world’s leading database authorities. Database Concepts gives undergraduate database management students and business professionals alike a firm understanding of the concepts behind the software, using Access 2016 to illustrate the concepts and techniques. Three projects run throughout the text, to show students how to apply the concepts to real-life business situations. The text provides flexibility for choosing the software instructors want to use in class; allows students to work with new, complete databases, including Wedgewood Pacific, Heather Sweeney Designs, and Wallingford Motors; and includes coverage for some of the latest information on databases available. David M. Kroenke entered the computing profession as a summer intern at the RAND Corporation in 1967. Since then, his career has spanned education, industry, consulting, and publishing. He has taught at the University of Washington, Colorado State University, and Seattle University. Over the years, he has led dozens of teaching seminars for college professors. In 1991 the International Association of Information Systems named him Computer Educator of the Year. In industry, Kroenke has worked for the U.S. Air Force and Boeing Computer Services, and he was a principal in the startup of three companies. He was also vice presi- dent of product marketing and development for the Microrim Corporation and was chief technologist for the database division of Wall Data, Inc. He is the father of the semantic object data model. Kroenke’s consulting clients include IBM Corporation, Microsoft, Computer Sciences Corporation, and numerous other companies and organizations. His text Database Processing: Fundamentals, Design, and Implementation, first pub- lished in 1977, is now in its 14th edition (coauthored with David Auer for the 11th, 12th, 13th, and 14th editions). He introduced Database Concepts (now in the eighth edition that you are reading) in 2003. Kroenke has published many other textbooks, including the clas- sic Business Computer Systems (1981). Recently, he has authored Using MIS (8th edition), Experiencing MIS (6th edition), MIS Essentials (4th edition), Processes, Systems and Information: An Introduction to MIS (2nd edition) (coauthored with Earl McKinney), and Essentials of Processes, Systems and Information (coauthored with Earl McKinney). An avid sailor, Kroenke also wrote Know Your Boat: The Guide to Everything That Makes Your Boat Work. Kroenke lives in Seattle, Washington. He is married and has two children and three grandchildren. David J. Auer is a Senior Instructor Emeritus at the College of Business (CBE) of Western Washington University in Bellingham, WA. He served as the director of Information Systems and Technology Services at CBE from 1994 to 2014 and taught in CBE’s Department of Decision Sciences from 1981 to 2015. He has taught CBE courses in quan- titative methods, production and operations management, statistics, finance, and manage- ment information systems. Besides managing CBE’s computer, network, and other technology resources, he also teaches management information systems courses. He has taught the Principles of Management Information Systems and Business Database Development courses, and he was responsible for developing CBE’s network infrastructure courses, including Computer Hardware and Operating Systems, Telecommunications, and Network Administration. Auer holds a bachelor’s degree in English literature from the University of Washington, a bachelor’s degree in mathematics and economics from Western Washington University, a master’s degree in economics from Western Washington University, and a master’s degree in counseling psychology from Western Washington University. He served as a commissioned officer in the U.S. Air Force, and he has also worked as an organizational development specialist and therapist for an employee assistance program (EAP). Auer and his wife, Donna, live in Bellingham, Washington. He has two children and four grandchildren. Scott L. Vandenberg has been on the Computer Science faculty at Siena College since 1993, where he regularly teaches three different database courses at several levels to both computer science and business majors. Prior to arriving at Siena, he taught undergraduate and graduate courses in database systems at the University of Massachusetts—Amherst. Since arriving at Siena, he also taught graduate and undergraduate database courses at the University of Washington—Seattle. He has developed five different database courses over this time. His other teaching experience includes introductory computer science, introduc- tory programming, data structures, management information systems, and three years teaching Siena’s required interdisciplinary freshman writing course. Vandenberg’s recent research publications are mainly in the areas of computer science education and data science applications, with earlier work on query optimization and alge- braic query languages. He holds a bachelor’s degree in mathematics and computer science from Cornell University and master’s and PhD degrees in computer science from the University of Wisconsin—Madison. Medieval history and playing hockey are two things that can tear him away from a database. Vandenberg lives in Averill Park, NY, with his wife, Kristin, and two children. Robert C. Yoder began his professional career at the University at Albany as a systems pro-grammer managing mainframes and Unix servers. He has two years of research experience working on 3-D solid modeling systems. Robert holds BS and MS degrees in computer science and a PhD in information science, all from the University at Albany. Yoder joined the Computer Science department at Siena College in 2001 and teaches Business Database, Management Information Systems, Geographic Information Systems, Data Structures, Networks, and Operating Systems courses. Yoder lives in Niskayuna, NY, with his wife, Diane, and two children and enjoys traveling, hiking, and walking his dog.